from College of William and Mary: detailed info to help you read, analyze and write about primary sources! Remember, when searching for primary sources the language of our time may not serve you well. 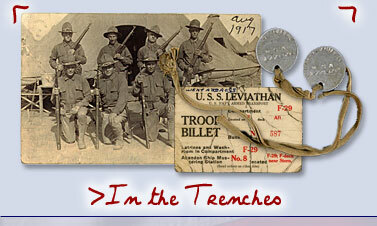 For instance, documents written during World War I would have referred to the conflict as "The Great War." The term "African American" is relatively modern in usage. Primary sources are often biased. As you analyze them, try to understand the lens through with you view them. 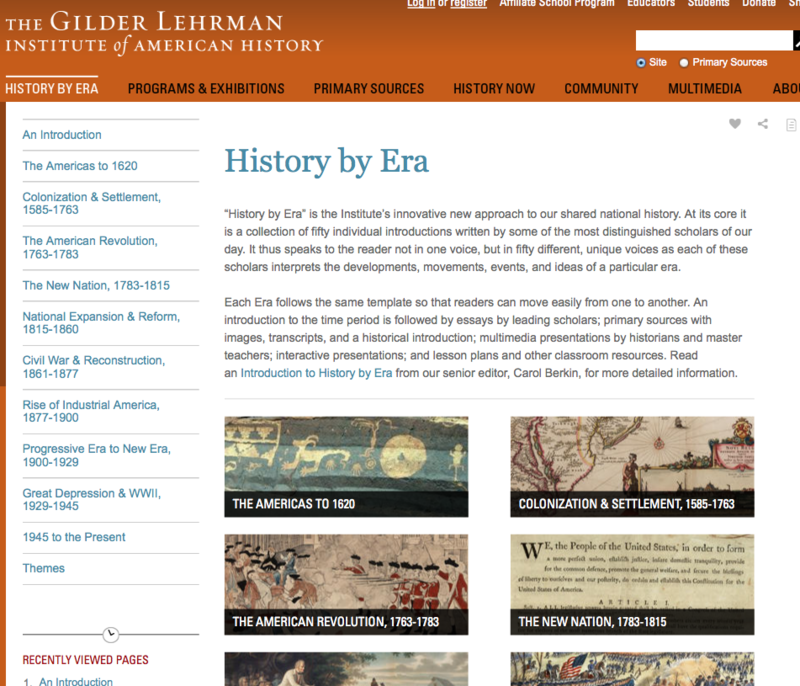 Annals of American History illuminate U.S. history from 1493 to modern times in over 2,000 primary documents—the original words of history-makers. Link to a list of 100 milestone documents, compiled by the National Archives and Records Administration, and drawn primarily from its nationwide holdings. 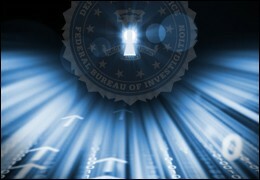 The documents chronicle United States history from 1776 to 1965.
and other other documents of the time. These sources serve as the raw material to interpret the past, and when they are used along with previous interpretations by historians, they provide the resources necessary for historical research. Avalon Project - Documents in Law, History and Diplomacy A collection of documents in history and law from ancient civilizations to the present. Chronicling America - The Library of Congress American newspapers 1860-1922. Civil War in America from The Illustrated London News Digital archive of the Illustrated London News during the Civil War years. Digital Library for the Decorative Arts and Material Culture digitized primary materials significant to the decorative arts and material culture of early America including electronic texts and facsimiles, image databases, and web resources. Documenting the American South Documenting the American South is a collection of sources on Southern history, literature and culture from the colonial period through the first decades of the 20th century. As of March 1, 2004, DAS includes 1,266 books and manuscripts. Founders' Constitution An online anthology of documents from the 17th century through the 1830's related to constitutional history. From the University of Chicago and the Liberty Fund. Google Book Search Now includes magazines. If you do an advanced search, you can limit your search by date and type of content. Not printable, but you can read the issues on screen. Internet History Sourcebooks Project Full text historical documents and links for ancient, medieval, and modern history. Paul Halsall/Fordham University. 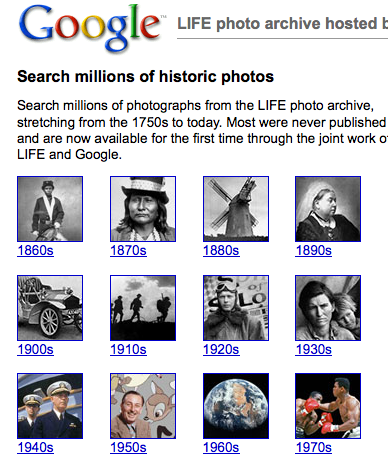 LIFE photo archive Millions of photographs from the LIFE photo archive, hosted by Google, stretching from the 1750s to today. Making of America Digital library of primary resources in American social history from the antebellum period through reconstruction including sociology as well as education, psychology, American history, religion, science and technology. Manuscript Collections Relating to Slavery from New York Historical Society. Mike Wallace Interview In the early 1960’s, broadcast journalist Mike Wallace donated 65 recorded interviews made in 1957-58 from his show The Mike Wallace Interview to the Harry Ransom Center at the University of Texas. The bulk of these were 16mm kinescope film recordings. Office of the Historian U.S.Department of State. Access to official historical documentary records of U.S. foreign policy. Picturing America Home Page National Endowment for the Humanities (NEH) "brings masterpieces of American art into classrooms and libraries nationwide." Picturing the thirties The Depression, The New Deal, The Country, Industry, Labor, The City, Leisure, and American People." Features artwork, photos, newsreels, and other material about 1930s history. Prelinger Archives "Ephemeral" (advertising, educational, industrial, and amateur) films made from 1927 through the present. Women Working - , 1800–1930 Harvard Open Collections Program; approximately 500,000 digitized pages and images focused on the role of women in the U.S. economy. Eyewitness History: WWII and More!